To say that Pittsburgh Riverhounds Head Coach Mark Steffens was perplexed by his team’s performance in their 2-1 loss to Louisville City on Saturday would be an understatement. Steffens, who has coached at this level for a long time — earning USL Hall of Fame honors and winning a pair of league championships — has a good idea how to navigate through the peaks and valleys of a soccer season. 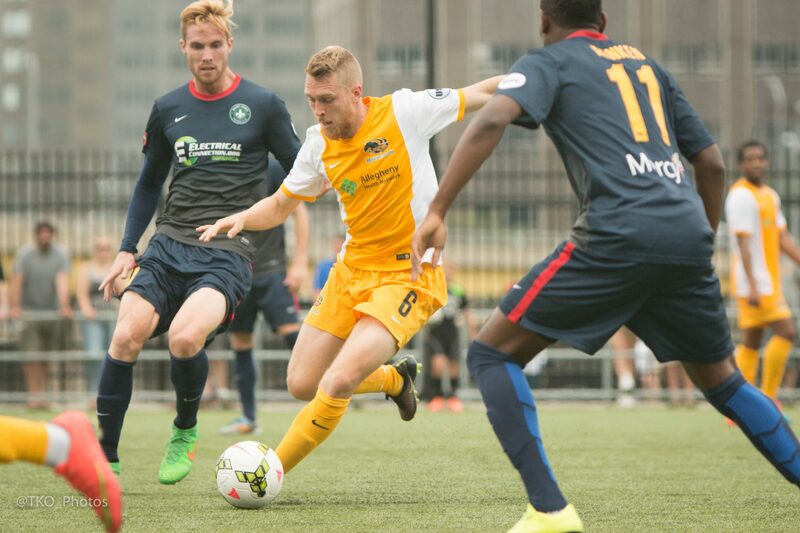 There’s no doubt that the Riverhounds, who have played 18 of their 28 game league grind in addition to a three-game U.S. Open Cup run in May and June, have hit a lull in a season that has had numerous high and low moments. After two impressive shutout wins in early July over NY Red Bulls II and Toronto, they’ve since stumbled against Montreal and Louisville. Heading into their third Keystone Derby encounter against intrastate rivals, Harrisburg City Islanders, could the Hounds be a team running out of steam? They are a team that has relied heavily on the offensive output of two players, Rob Vincent and Kevin Kerr, and have only had scattered and inconsistent contributions from the remaining players slotted in the other attacking spots. Kerr and Vincent have played almost every minute of every league game. Steffens kept Kerr out of the starting lineup in Montreal on July 12, in a game where Pittsburgh lacked energy and creativity. Unfortunately, the team came out very lethargic, conceding an early goal on a defensive mistake and battled uphill the rest of that game against a rejuvenated FC Montreal side. I’m not too sure it wasn’t a coincidence that the team seemed to be playing on fumes without Kerr in the lineup. In theory, it was the right move. Steffens knows the rigors of the season, and it was wise to rest one of the players who’s logged a lot of minutes against a team that they had dominated just a few weeks earlier. A week later, they lost again, in a game vs Louisville team that was right ahead of them in the standings, before a home sellout crowd, that had Steffens in disbelief. “We looked absolutely exhausted. Like we didn’t have any legs. That shouldn’t be the case,” said Steffens. Vincent has been as good as gold as a finisher as there is in USL — with any room to shoot in-and-around the box he’s been automatic, with league’s second best 12 goals. He’s started every one of the team’s 18 games. Only Mike Green and Stephen Okai have also appeared in each game. The Riverhounds have not been good enough to win games without Kerr and Vincent, who’ve played mostly in attacking midfield spots on the outside. One of the most glaring deficiencies and grumblings from the loyal fans and those who follow the team closely has been with the strikers. Throw in the attacking central midfield position — as players who’ve been in that spot have also provided inconsistent production. This has already been picked apart in some of my post-game and midseason analysis’s. Vini Dantas and Miro Cabrilo, who’ve played a bulk of the minutes at the lone target forward position, have combined for 3 goals and 3 assists. Drew Russell, Mike Green and even central defender Fejiro Okiomah got a start at the forward spot. Amara Soumah has played in some spot minutes at forward. The lone player who they have on their roster, who is a natural forward, who has not seen any significant playing time or even been on the substitutions list is former Rutgers University standout Kene Eze. In the attacking 4-2-3-1 formation that the Hounds have utilized most of the season, the central attacking midfield role has been occupied mostly by Lebo Moloto, but we’ve also seen Green, Max Touloute and Soumah in this spot at times. Boris Zivanovic has been coming in late in games — playing in one of the wing spots that Kerr and Vincent have occupied, as one of them may slide inside or to the top if necessary. Despite his strong leg and occasional dangerous shots from distance, Stephen Okai has not scored from the holding MF slot, but the other holding midfielder and captain Danny Earls has capitalized on a few scoring chances for three goals for the season, including two in the Harrisburg comeback. Rob Vincent has the attention of league opponents, as he’s been a threat to score everytime he’s in the attacking third. Kerr and Vincent have scored 20 of the Hounds 36 league goals — and they’ve also combined for 11 assists. Moloto has two goals and four assists, but if you take away the league record three assists versus Harrisburg on May 30, when he clearly had his best performance of the season, he’s been pretty quiet in terms of being a difference-maker in the Hounds attack. The target forwards don’t necessarily have to score a lot of goals, but still have not been doing enough to draw defensive attention or finish when the opportunities come. Steffens admitted on Saturday that he’s still looking for answers at forward. “That’s why we keep experimenting. They’ve done okay. But, nobody’s really stepped forward to be the guy. That’s why we keep rotating. Nobody’s really scoring goals, getting assists from there. Or holding the ball up enough. I am not sure the guys are not going to be happy hearing this, but we have to do better,” said Steffens. Kerr was a bit more diplomatic about the lack of production from the forward spot, citing that the Hounds are still atop the Eastern Conference in goals. “It’s been a strain — but we’re still scoring goals. It would be nice to have someone to knock it down from there. But as long as the goals keep going in, we’ll be happy,” said Kerr. Kerr and Vincent have been resilient all season long, but it’s going to be difficult for this team to sustain a strong push toward a playoff berth and be a threat to go farther — without more support from whomever occupies the forward position and the other attacking midfielders. Although it’s not completely out of the realm of possibility, it’s very unlikely that with a fixed payroll budget that the Hounds will be buyers in the coming weeks. They’ve made an investment in building this year’s team around a mostly young roster. At the outset of the season they did bring in Willie Hunt to shore up their banged up back line, and a few weeks later added Boris Zivanovic from Serbia for attacking midfield depth. Therefore it will be hard to fathom, as long as the team is mostly healthy, that they would break their bank (or maybe break into a bank!) to try to bring in an additional scoring threat, even as they lead the Eastern Conference in scoring. The team could very well be rejuvenated by the return of Jamaica’s Gold Cup hero Ryan Thompson, as the goalkeeper’s presence alone could lift his teammates — as he will likely be ready to contribute starting with their next home game vs Wilmington. But first things first. A positive result on the road on Sunday against Harrisburg will help Hounds right their ship — and stay in line for a playoffs as they currently hold the sixth and final spot in USL’s Eastern Conference. “There are no easy games remaining,” said Steffens. The recent run of play has brought some weaknesses to the forefront and have shown how reliant the Hounds have been on Kerr and Vincent. Steffens knows playoff teams get better as the season progresses. This team is not. “It’s that time of the year. Every game is like a Cup final. Every win and every loss gets bigger with our chances. They get bigger each week,” said Kerr. Factor in all those minutes played, the emotional and physical rigors of playing in Open Cup games vs Tampa Bay and D.C. United — the amazing comeback vs Harrisburg along with physically challenging opponents like Rochester and Louisville — and the Riverhounds two best scorers Kerr and Vincent, despite seemingly taking themselves to the limit each game, appear determined to keep pushing forward. The question is, do they have enough left in the tank — and can they get some much needed support?